From the suggestion box at CDM, we’re taking a look at DIY party-rocking sound system technology from the birth of Hip-Hop. Ed. : Resident DIY expert and editor-at-large Michael Una returns – and the man has been known to do strange things with speakers himself. Say you’re an up-and-coming crew with a turntable and some mics. You’ve got a gig this Friday at the middle school gym (the janitor has been bribed appropriately) and the boys on the corner have been passing out your flyers to all the lovely ladies. Everything’s set, except you heard that Kool Herc is coming to battle. Herc and his mighty sound system schooled you last go-round, so you know you need something fresh to rock the bodies proper. Your DIY solution? 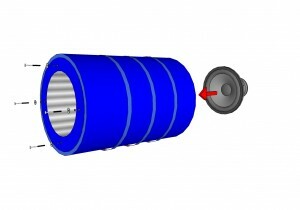 The 55-gallon drum sound system. 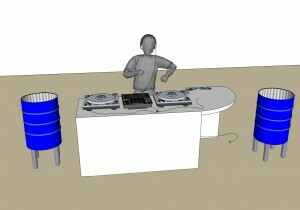 Step 1: Get yourself two steel 55-gallon barrels and two 15-inch subwoofer cones. Step 2: Have one of your buddies who works at the auto shop around the corner cut a hole in the bottom of each barrel. Drill some holes to mount the speaker facing out from the bottom of the barrel. Step 3: Face the can towards the floor and have your buddy weld some 6-inch pieces of pipe on to boost it up a bit. Hook up your dad’s hi-fi stereo amp, plug in your mixer, and turn it up as loud as it will go (10 block radius). Get those bodies movin’. Big thanks to DJ Mister P-Body and the book Yes Yes Y’All: The Experience Music Project Oral History of Hip-Hop’s First Decade. This idea comes from a story told by Tony Tone and DJ Baron about their early experiences as an MC/DJ duo.